The SBD-1 was the first model of Douglas's outstanding Dauntless line of scout bombers. It was developed from the BT-1, incorporating a host of improvements and modifications. Later models went on to fame turning the course of the Pacific war in the batttles of the Coral Sea and Midway. Replacement with the later Curtiss Helldiver was done with much regret, and the horrible handling and lack of power in that aircraft made many crews miss the "slow but deadly" Dauntless. Suprisingly, the aircraft which was going to go on to such fame was initially rejected by the USN, and the aircraft turned over to the Marine bombing squadrons. These colorful aircraft contributed to training our forces prior to WWII. The kit is another standout from Accurate Miniatures. It features over 100 parts in grey plastic, with fine detail - not that this is a suprise! Everything is well molded and bagged, with the typical AM "false floor" to protect the clear parts, decals, and instructions. The instructions are very clear, and should, as usual, be followed closely - or you can go to Accurate Miniatures' site and follow their founder's online build, which goes slightly out of order, but gives explanations and alternatives. The decals are quite extensive - they allow you to make one of 39 (!) Marine SBD-1s. I *believe* this is a good chunk of, if not the full SBD-1 production run. The only differences in schemes are the cowl and chevron colors and markings, and serials. 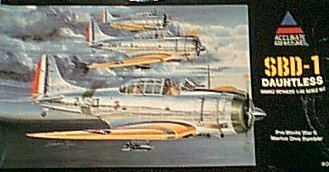 These are *all* silver laquer with chrome yellow wings - something that will definately stand out from the grey/blue, dark blue, or white/lt blue/blue markings of most WWII Navy aircraft.